Approximately six percent of the registered nurse (RN) population works in home healthcare services. They travel to patients’ homes, schools, community centers, or nursing homes to provide secondary or tertiary care. Home health nurses offer hands-on treatment, and they educate patients and family members about proper care and prevention. They work with a broad range of patients including the elderly, the terminally ill, the physically disabled, patients in accident rehabilitation, mothers recovering from childbirth, and sick infants. Home health nurses may fill some of the same duties as certified nursing assistants (CNAs) and licensed practical nurses (LPNs), such as bathing and dressing patients. They are also licensed to provide specialized care like administering medicines and treatments, performing diagnostic tests, operating medical equipment, recording medical histories and symptoms, treating wounds, and establishing care plans. 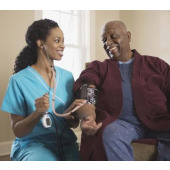 To become a home health nurse, you must first gain licensure as a registered nurse. There are well over 2,000 state-approved RN training programs across the country. Many are taught at technical schools, community colleges, and hospitals, while the most prestigious are offered at four-year colleges and universities. Three common pathways to RN licensure are the bachelor of science in nursing (BSN), associate’s degree in nursing (ADN), and hospital diploma. ADN and hospital diploma programs require two to three years of fulltime study, while a BSN program takes four years to complete. Although it may take longer, the BSN pathway is the preferred credential of many top healthcare employers. All pathways prepare graduates to pass the National Council Licensure Examination (NCLEX), which is mandatory in all states. Additional certification is not required for home health nurses. This option was once available, but the American Nurses Credentialing Center (ANCC) has since retired both the home healthcare nurse and the home health clinical nurse specialist exams. Certification renewal is the only option for home health nurses that already have the credential. Another credential, the Certificate for OASIS Specialist-Clinical (COS-C), is a voluntary certificate that enables home care providers to demonstrate their expertise in Outcome and Assessment Information Set (OASIS) data accuracy. According to Wolters Kluwer’s Lippincott Nursing Center, certification in OASIS completion is becoming critically important. This certification could enhance a home health nurse’s earnings potential and employment opportunities. A successful home health nursing career starts with an RN degree from an accredited college or university. Browse our directory to find the best ADN and BSN programs in your local area.